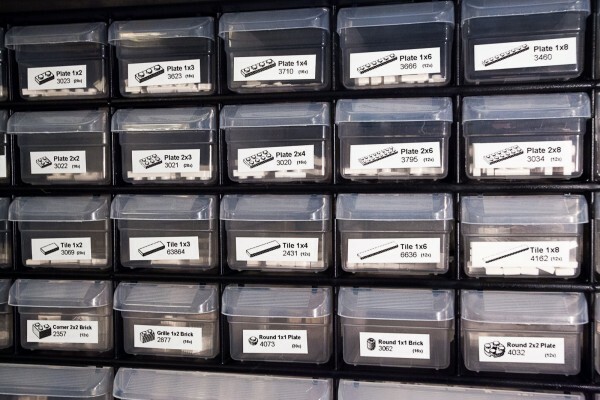 After posting the article From buckets to bins: How to sort a lot of Lego, I received several requests to share the files I created so other LEGO fans can print the labels without painstakingly creating a label for each part. I am happy to share ready-to-print labels which you can print at home with a Brother PC Label printer, such as the inexpensive PT-P700 which replaces the PT-1230PC which I use. Download the latest version of these labels at http://tomalphin.com/bricklabels. Just uploaded an updated version with the correct photos for 2×6 and 2×8 plates. Awesome, thanks for supplying your work. Soon I’ll be starting to sort about 35lbs of mixed lego pieces. I know most of them belong to sets, not just random pieces, so I need a way to 1) identify 2) store and 3) find a way that says with these pieces you can make this set. I believe http://www.peeron.com can solve #3 but identifying I think will be the long part. Any tips on this? Thanks again. @Chris Cozort: No, I don’t get a kickback from Brother. (I wish!) I do get a small commission if you buy anything from Amazon through the links on my blog, so please feel free to use my referral links. When I took on the project, I did some research into the available labeling systems, and found that the Brother system was the lowest cost and offered very durable waterproof labels. I also use Brother labels with my phone # and address to label my computer and camera gear. It really is a good labeling system. I just started on my 3rd roll of label tape in almost exactly a year. Awesome labels, I’m hooked too! I’m also hooked. Bought the PT-1230C through your link. Looking forward to Technics and any others you come up with. Thanks for posting these labels, Tom – I love them and have been looking for something like this for years! Very smart idea to use batch files to automate some of the repetition, too. Do you work in IT like me? haha. I’m definitely going to modify your work to fit my collection – it was very generous of you to include everything like you did. Thanks again. Love this! Anyway you can just make a PDF for the rest of us? Could you post an example or have a look at mine? Unfortunately, a .bat file is a type of script (or very simple program) which can only run on a Windows PC. I am sure the same can be achieved using a MAC, but I neither own a Mac, nor know the correct instructions to make the scripts work. Maybe try it on a PC? I really like the labels, How do you create the images?, I would like to expand on them myself. Whenever I copy a picture of a brick from a website such as bricklink the brick image does not print so well and is very faint. @Paul, If you download my instructions you will find a folder with scripts you can modify to make these brick images. I modified the scripts to make the bricks extremely bold and easier to print from the LDraw application defaults. I’m actually working on a set of Technic part labels today and hope to share them soon! Thank tom, I did download the scripts, im running windows 8.1, and when I click on the script, it appears for a few seconds then disappears? I have checked the file paths and they seem correct, I have also try in administrator mode and no difference?? In the meantime, hopefully the new collection of Technic labels will help! Ok Thanks so much Tim these are absolutely amazing the Technic brick will keep my printer busy and expand my storage capabilities! cheers! Thanks Tom! I’m going to try using the PDF to make Avery sticker templates. Got my AM storage units coming in on Sunday. Would love to post a before/after set of pics, but if I did manage to translate the PDF into an Avery template I’ll send you a link since more people have regular printers than label printers.